Capture, wash and classify very fine grit to protect downstream processes from abrasion and deposition. The SlurryCup™ uses two levels of separation and classification to capture, wash and classify grit as small as 75 µm from grit slurries, primary and secondary sludge, protecting downstream processes from abrasive wear and clogging. 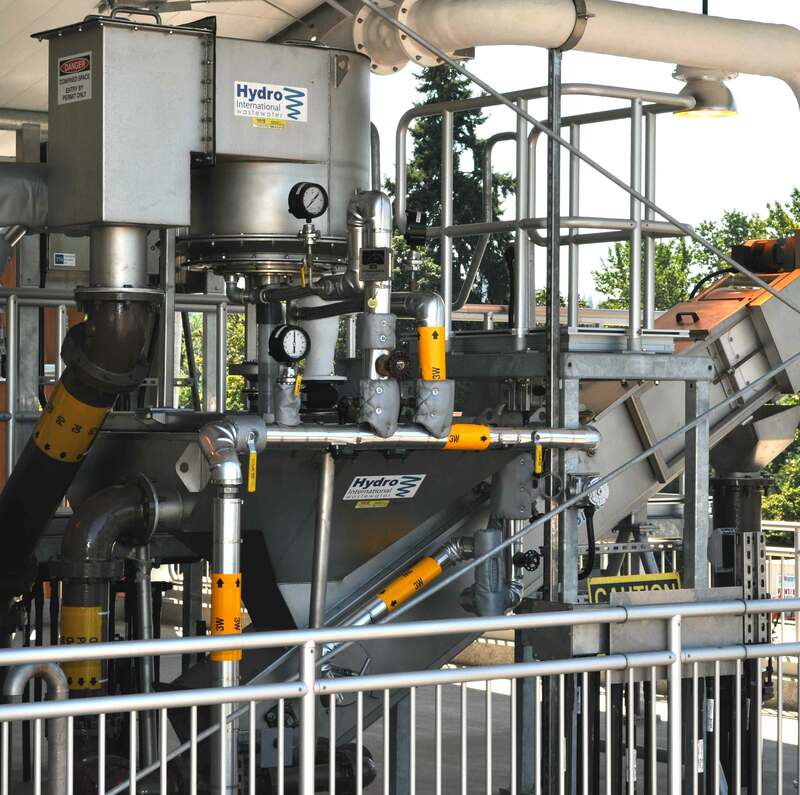 With no internal moving parts, the SlurryCup™ is a low-maintenance solution that produces clean grit ready for dewatering, minimizing organic content and cutting the volume of solids hauled to landfill. The SlurryCup™ is a grit washing system that employs two levels of separation and classification to capture, wash and classify grit as small as 75 µm from grit slurries, primary and secondary sludge, protecting downstream processes from abrasive wear and clogging. The SlurryCup™ is extremely effective at washing grit captured at the preliminary treatment stage by the grit channel, aerated grit chamber, vortex grit collector, or grit separator. The clean grit slurry produced by the SlurryCup™, when dewatered by a Grit Snail®, contains 60% total solids with less than 15% organic solids in headworks applications, reducing the cost of solids handling and haulage to solid waste disposal sites, as well as reducing odors and associated aesthetic complaints. With no internal moving parts, the SlurryCup™ is a low-maintenance, high-performance grit removal system that delivers effective grit washing, separation and classification. Watch a brief video demonstrating the SlurryCup™ here. Download the SlurryCup™ brochure here. As flows increase so do the demands on your wastewater treatment plant - grit deposited in pipes and channels can be rapidly flushed into the plant and overwhelm expensive downstream processes. The free vortex boundary layer grit washing provided by the SlurryCup™ protects your plant when it needs it the most. Designed for low flow performance you can rest assured that your plant will also be protected when big flows strike. 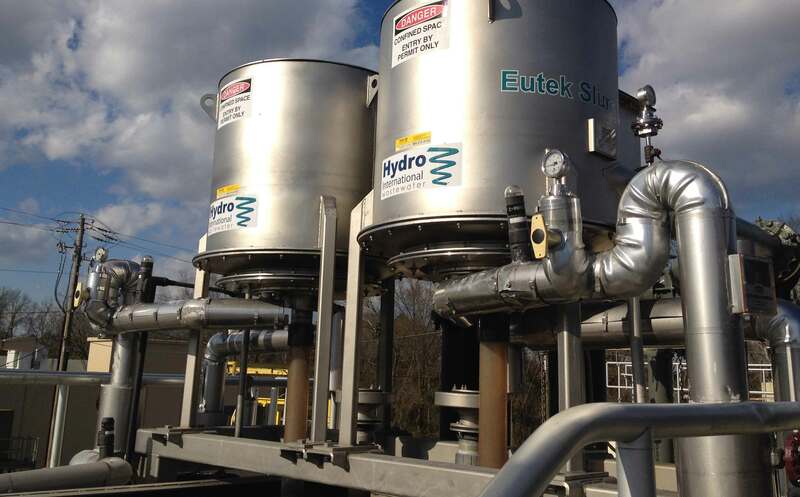 One or two SlurryCup™ units can be mounted on a single Grit Snail® clarifier saving plant space while improving performance. The system is designed for fully automatic operation and can be switched to manual mode as needed. Built with the operator in mind, ease of maintenance has been engineered into all elements of the SlurryCup™. 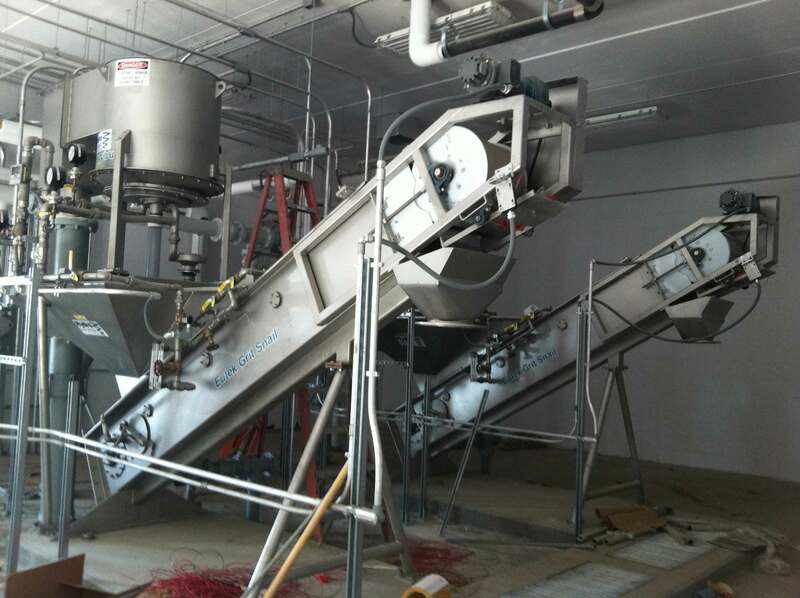 Removing grit from sludge is an abrasive and demanding process. The SlurryCup™ is designed for durability to meet the challenges inherent to this difficult application. The SlurryCup™ operates completely hydraulically and has no internal moving parts, making it a low-maintenance solution. Boundary layer separation and free vortex forces wash volatile solids from even the smallest grit particles without releasing them back into the plant. 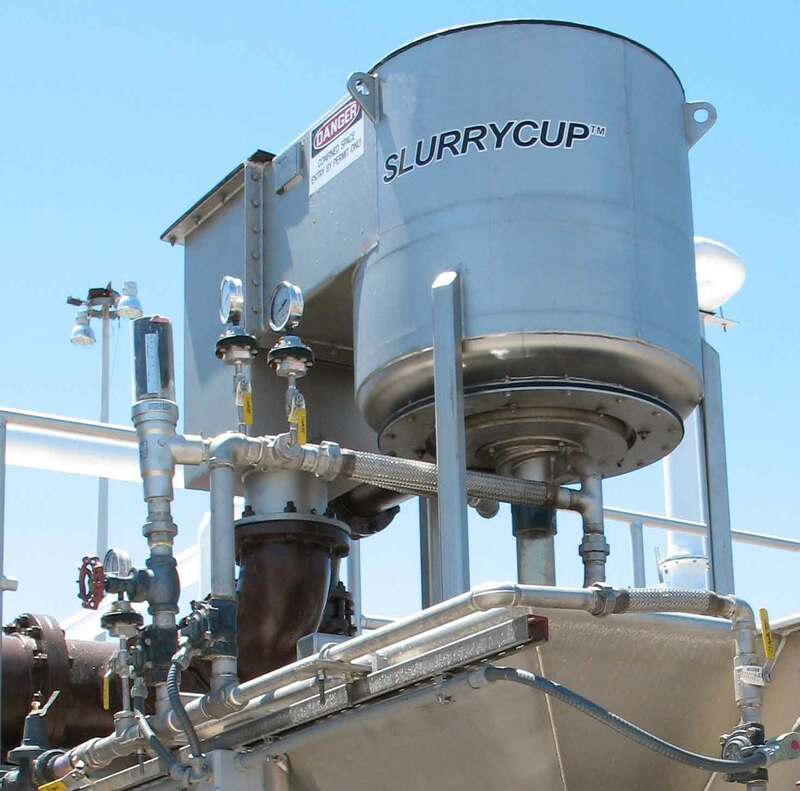 The SlurryCup™ uses a combination of an open free vortex and the accelerated gravity boundary layer effect to capture, classify, and remove fine grit, sugar sand, and high density fixed solids from grit slurries, and both primary and secondary sludge. The grit underflow from the SlurryCup™ passes through a hydraulic valve, which provides secondary grit washing. A.SlurryCup™ performance actually increases as the flow increases. Increased flows increase the amount of grit entering a plant, making performance at peak flows critical in eliminating grit problems. A.Yes, the SlurryCup™ can be used to remove grit from sludges (up to 1.5% total solids) in a number of processes throughout the plant. A.The SlurryCup™ uses only hydraulic forces in order to separate grit from organic materials. This provides the advantage of no moving parts and no power requirements for operation. Tangential entry of flow creates a boundary layer effect, which effectively holds fine grit particles in place while higher velocity flows wash away the organic materials. This boundary layer cleaning is able to retain the very fine grit particles which other types of systems are unable to capture. Missing fine grit particles causes significant deposition problems in downstream processes in plants around the world. An Advanced Grit Management system with 10 HeadCell® separators, 10 SlurryCup™ washing units, and 5 Grit Snail® dewatering escalators improved grit capture from <30% to 95%.